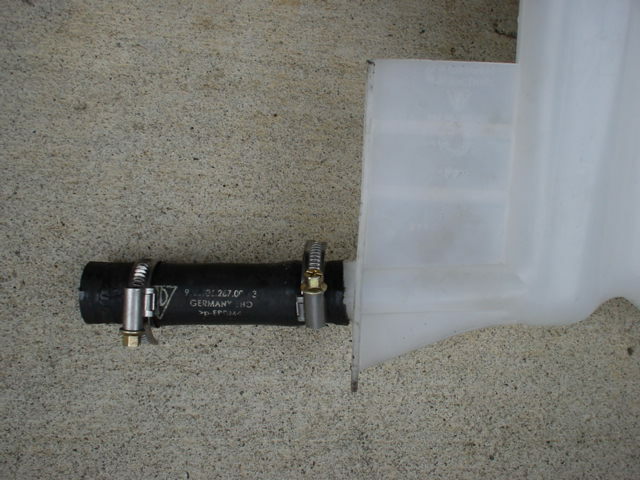 A simple way to see if you tank is leaking is to pull up the carpet in the rear trunk. If your tank is leaking, you will see coolant under the carpet. Thanks for the input. That was my thought a well but was told by both the service rep and the parts person at Sunset that I wouldn't necessarily see the leak in the truck. My concern is that it cracks at the firewall and there is something that I'm not going to know about or need another part for until I take the tank out. you don't need any other parts. 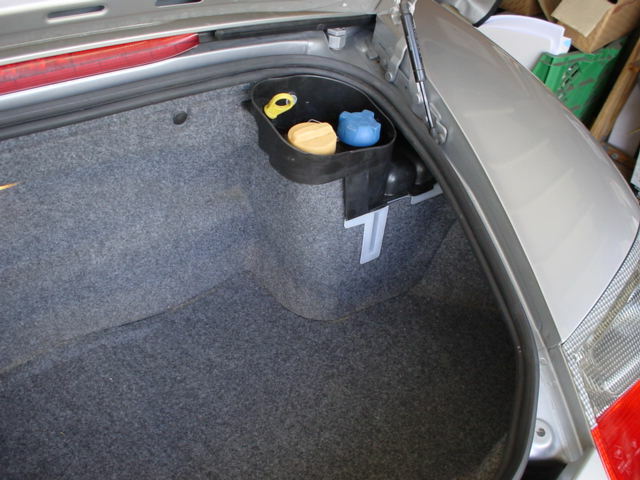 if you remove the carpet in the trunk, you can see most of the reservoir so you can inspect it for cracks. if it is leaking, PTEC is correct in that you will likely see coolant beneath the reservoir. the job is not that hard (simple in concept, tricky in practice); access is the only issue. get yourself a GOOD set of hose clamp pliers or you will curse the gods. Take your car to a radiator shop and have them pressure test the tank and cap - it is standard VW/Audi threads. The tank cracks. http://www.renntech.org/forums/index.php?showtopic=1838 The Boxster is 8 years old. Last time I checked Porsche was on the 9th generation tank in 8 years. And you have a 1999..... It is also a problem with the 996. I can only guess that is why your service rep suggested this as a problem. But first, make sure the coolant is at the max level and a low coolant level is not the cause of your light. When the tank is just a bit low the light will go on. When you restart the car and the coolant is hot then the light does not come on because the coolant has expanded and raised the level. You need to rule out a low level condition first. I've never seen a tank that was cracked that wasnt leaking into the trunk. Top off your coolant and keep driving it. If the light comes back, pull up the carpet... its a few minute job and you'll find out for sure real quick if the tank is your problem..... (and it almost always is). I just replaced the coolant tank in my 2001 S. The most difficult part was replacing the coolant hose which is attached to the tank from the engine compartment. There is no easy way to get to it except by removing the right rear wheel and getting under the car. Be sure to use a jackstand. The method of determining the source of the loss is as follows. Top off the cooling system. If coolant does fall out on the ground, trace it to its source and repair it. If the coolant does not escape quickly, you must leave the pressure on the system until the level drops noticeably. If the coolant leaks into the cylinder, the engine will not turn over. You then remove the spark plugs, rotate the engine, and watch to see which cylinder “Old Faithful” starts spraying out of. If it leaks into the crankcase, the coolant will mix with the oil. After sitting for some time the oil and water will separate. Since oil is lighter than water, the water will settle on the bottom of the oil pan and pour out first when the drain plug is removed. But what if none of these things happen? What if coolant is being added to the car slowly over time, and shows no signs of escape. This was the case for me a few months ago. 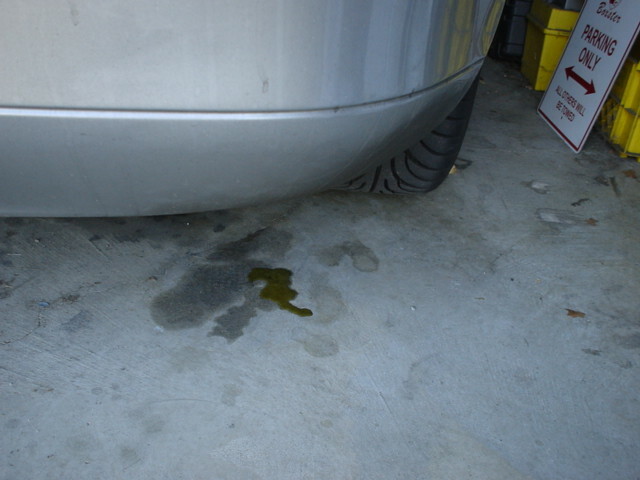 While waiting for something to happen after pressurizing the system, I noticed a drip of coolant escaping the car. But this was not a normal location for a coolant leak. The coolant was not leaking from the engine, but out of the right rear jack lifting point! Now this was a little perplexing as there are no cooling system components in the area. Then it hit me, (OK, maybe it actually dripped on me). 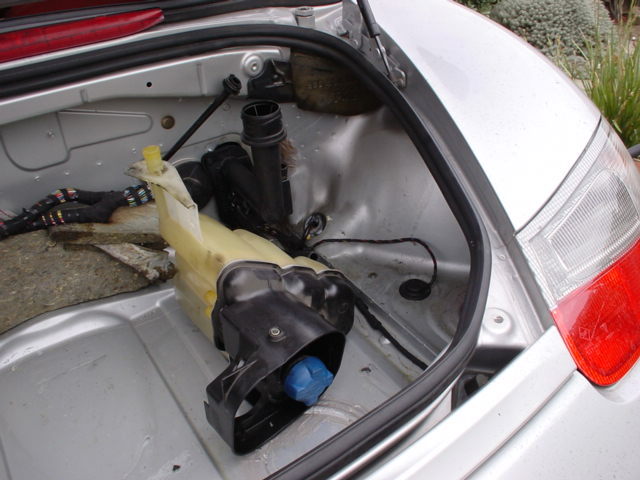 The only thing that was even in the vicinity of the drip was the coolant reservoir mounted in the rear trunk. I looked in the trunk and started pulling carpet out to access the coolant reservoir. Under the carpet is a wooden flooring, so out it went as well. and the coolant deposits on the side of the tank. If you find that your Boxster is loosing coolant in a mysterious fashion, you can simply pull back the carpet surrounding the coolant tank. Complete removal of the carpet and flooring is only necessary when the tank is being replaced. At first glance this seems to be a very straightforward process. The tank and mounting bolts are right there in the trunk. There is also an oil filler pipe integrated into the tank but that doesn’t look to be a problem. The problem lies not in the trunk, but on the other side of the firewall in the engine compartment. That is where the coolant and oil hoses connect to the engine. 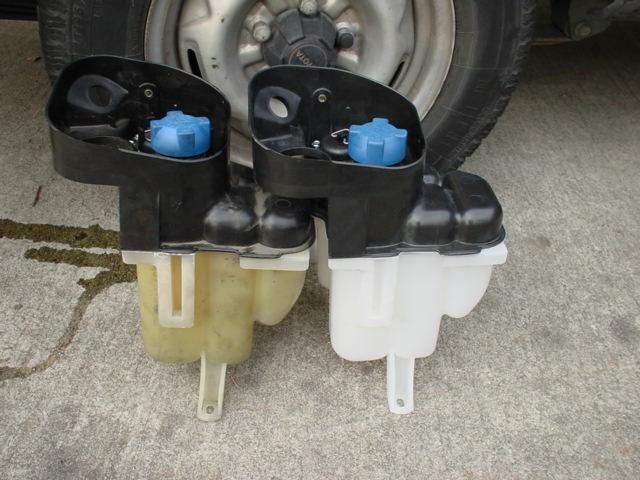 They are connected with a series of pressure clamps that you may have seen before on Japanese cars. You must remove these pressure clamps before removing the coolant tank. Getting to the clamps is another issue. They cannot be accessed from the trunk or the top of the engine compartment. They must be accessed from the bottom of the car. Unless you are 10 inches tall you will also have to remove the large aluminum protection plate on the bottom of the car. This is also not as easy as it seems. The plate is sandwiched between the chassis and some aluminum braces, which all must be removed. If after all these obstacles, you still want to tackle this project, continue reading and I will attempt to guide you through the process. A factory service manual is highly recommended for this service procedure. This is due to the fact that there are several small details that may be omitted here due space constraints. Remove coolant and oil filler caps. Remove reservoir cover and release coolant bleed valve (pull steel ring up into the locked position). Remove the top sealing ring of the reservoir. Safely raise car and remove the plastic engine protection cover, and aluminum protection plate from the underside of car. Drain the coolant at the bottom of the engine coolant housing. Reinstall the drain plug and tighten after coolant has drained. between the engine and trunk firewall. Now go top the top side of the car and remove all the trunk carpeting and wooden flooring. 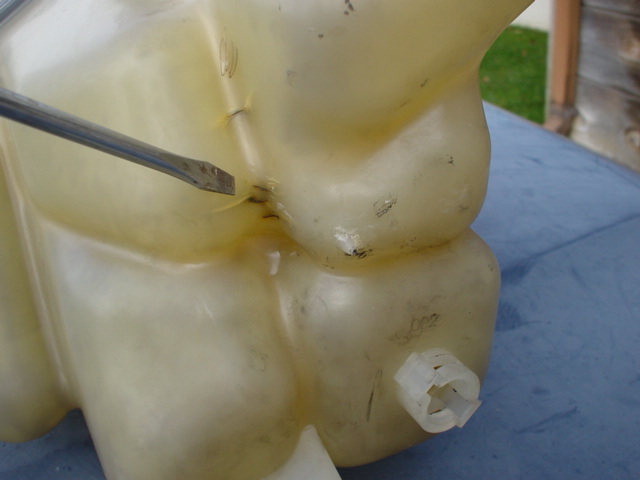 Remove the electrical plug attached to the coolant level sender at the bottom of the tank. Now remove the three mounting nuts and bolts holding the tank to the trunk wall. The tank is sandwiched between itself, a gasket and the firewall. Remove the oil dipstick and guide tube attached to the reservoir. Hold tank up side down and look for discoloration at leak points. Once the tank is out use a wet/dry vacuum or other means to remove all the coolant from the trunk floor. Transfer the coolant level sender and the three elbow hoses from the old tank to the new one. Mount the new tank ( 996.106.147.07 = $217.76 ) to the trunk firewall. All earlier coolant tanks, 996.106.147 .03/.04/.06 have been superseded to this 996.106.147 .07 tank. From the bottom of the car, reattach the one oil hose and 3 coolant hoses to their original locations. From the top of the car, reinstall the oil filler cap. Release the bleed valve, leaving the bail in the upright position. Turn the heater control to Max. Heat. Fill the cooling system slowly with Porsche factory coolant part # 000.043.203.78. (Quarts). Mix this coolant with distilled water at a 50% mixture. It is imperative to fill the system very slowly so as many air bubbles as possible can come to the top. Fill the tank until the coolant meets the bottom of the filler neck. Now start the car let it idle, add coolant as necessary to maintain a level at the bottom of the filler neck. Install the reservoir cap. Raise engine speed to 2500 R.P.M. Rev engine quickly, several times during this process. The surging of coolant flow is needed to get all of the air pockets out of the system. Let the engine temperature increase to 185 degrees and then close the bleed valve bail. Let engine come down to an idle and verify that the cooling fans are cycling on and off. Check car for any coolant leaks. If all seems well and no coolant leaks are present, reinstall the two lower covers. After the car cools off completely the coolant level should be between the Min/Max indicator marks on the tank. If they are not, correct the coolant level. 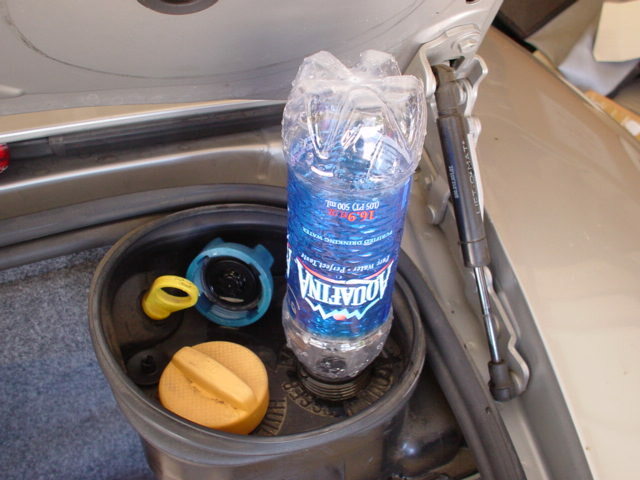 As an extra precaution, you may want to re-pressurize the car cold, to make sure there have been no overlooked leaks. Wow! Thanks for the input and advice from everyone. So, since I don't have a hot tub in the trunk and I no longer have the flashing warning light and my temperature stays consistently normal on both short and long drives, am I just being railroaded by the dealer? Were they just looking to get another chunk of cash from me assuming I'm ignorant? I would hope not. But it would seem so. I don't ever recall hearing of an automotive leak that simply clears up on its own. Generally, they get progressively worse. I will continue to monitor the water level and temp readings. If it seems a tank replacement becomes necassary, then I will be doing it myself. I did a full rotor and pad replacement and am getting into working on my car now. My wife laughs that now as I approach forty I have decided I want to be a mechanic. I would like to express my thanks to the host(s) of this fine site and hosts of the other sites in the Porsche community. You provide me, among others, with a wealth of information. For that I am grateful and wish you continued success. I would also like to thank everyone that visits these sites. Whether your participation is as diligent a pursuit as that which is exhibited by ToolPants or simply the casual reader. All are Porsche enthusiasts. Without you, none of this would be possible. My thanks to you all. My hat's off to you all. I should have known my October 12th post would bring me bad luck. For the past few weeks I have had to add 1/2 liter of water to the tank every day for my work commute to keep the light off. I crossed my fingers and hoped it was the tank and not a head gasket. I have had no time to pull the carpet out of the rear trunk to check on the tank. And my trunk is loaded with stuff. When I open the trunk and the car is driven and hot I can smell coolant. Finally, I saw it on the ground a few days ago when I parked the car in the garage - much to my relief - that is was going to be just a "tank job" when I could find the time. The stuff on the ground even tasted like ... coolant. And looked like coolant. Last November I bought the latest version of the tank on ebay for the lucky price of $90, and because with a 1997 I just had a feeling it was just a matter of time. It is now my time. Back then I even bought a special spring band hose clamp remover, just in case. Never used it, but now I will give it a test. So my leaky Boxster and I paid a visit to the local dealer with my ebay tank in hand to tell service and parts that it cannot be too hard to make a plastic tank that does not split under pressure. 7 or 8 versions of the tank. 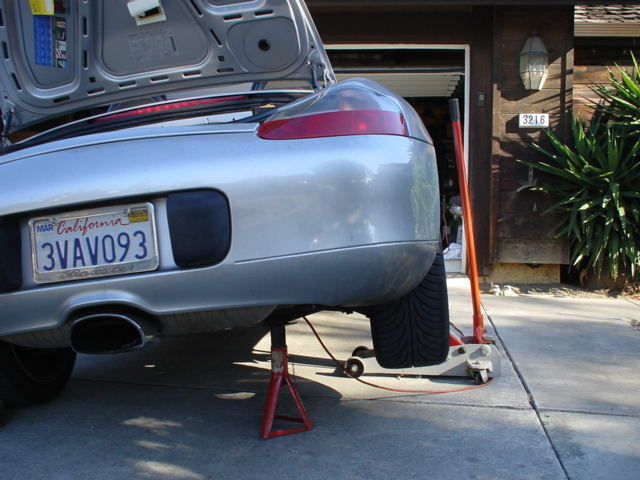 And this also a problem with the 996. If you did not already know, GEIGER makes the plastic tanks. Do not buy stock in this company. So I had the parts guy pull the latest version of the tank, which I put next to my 986 ebay tank, which is now also a 987 tank. See if you can figure out the difference between the two tanks. Then I spoke to a mechanic who told me how to get to the pesky hose clamp in the engine compartment. And then he gave me a 01 cap. My 1997 does not even have a 00 cap. I still have the VW/Audi cap with no Porsche part number on it. Yeah, it is a lot of fun, just like getting dental work is fun. My tank had three big cracks in it and tons of small, emerging ones. Anyway, here's my helpful 2 cents: Prestone Extended Life antifreeze/coolant is compatible with our Porsche coolant. A gallon or so mixed 50/50 with distilled water will top everything off. Jacked up the car today to see how hard it was going to be to get to that pesky clamp when the car is not on a lift. I cannot even see it. If I reach my hand up to where it should be and I can feel it. Thank god the ears of the clamp are facing down. If I could only pinch that clamp open with my fingers. Getting the hose clamp tool in there is not going to be fun. I think I will give it another try with the wheel off and try to go in from a different direction. New tank and cap looks pretty though. Horrible news about your tank ToolPants. Sorry to hear. Glad you got a good deal on the tank though. You're right about the tire removal. I read somewhere that the best way to get to the clamps is by removing the rear tire. Hope the change out goes well for you. Good luck. This is not a good design. Went back to the mechanic today and asked him to show me how he can get the clamp removal tool on the clamp, even when the car is on a lift. I have the same tool he has. He went in the same way I tried, reached for the wrong clamp by feel, then found the right clamp, by feel. I was holding and watching with his flashlight so he could not see what he was doing. I cannot see how removing the wheel is going to do anything to help you get to the clamp. I am not going to remove the plate that is shaped like a triangle. I will release that clamp. Warning - the yellow arrow is pointing to the wrong hose. So far the clamp I wanted to remove has won. :cursing: So I had to go to the other clamp at the end of the rubber hose. This was not the plan. This is a stupid design. But I did get the old tank out. Gave up playing around with the clamp and the rubber hose from the bottom of the engine because there is little to no room to work or to see what you are doing. So, let's take a look at the situation from the top of the engine. I do not know anyone who has tried it from the top because they all say you cannot get to the hose. You can. Then I could see what I was doing. Then I could get to the hose and clamp. 10 minutes later the tank was in. Filled it up and drove around. Back to normal. Gave up trying to clamp the rubber hose from the bottom of the engine because there is lttle to no room to work and see what you are doing. So, let's take a look at the situation from the top of the engine. I do not know anyone who has tried it from the top because they all say you cannot get to the hose. So, what did you do? Pull the end of the hose through the firewall to get to the clamp or stick your hose clamp pliers through the opening in the firewall? Please clarify. 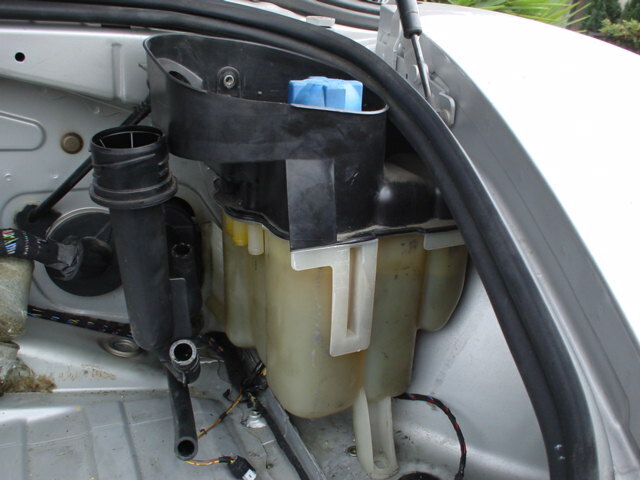 The plastic tank in the trunk is connected to a metal tube in the engine compartment via a rubber hose about 3" long. The rubber hose has a clamp at each end. 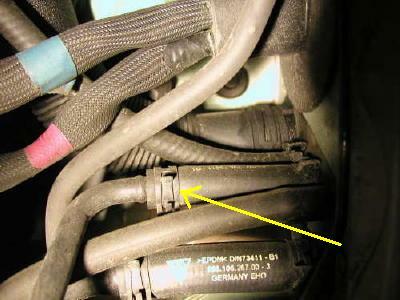 You are supposed to remove the clamp at the end of the rubber hose where it is connected to the metal tube. This is the spring band type clamp that is a pain to get to because you have to do it from under the car because the ears of the clamp face the ground. Then when you pull the old tank out you have the 3" rubber hose connected to the tank. I was able to remove the clamp but the rubber hose had 'glued' itself to the metal tube. I did eventually get the tank and the rubber hose out a different way. So then it was time to put the new tank in and put the clamp on the rubber hose where the hose connects to the metal tube. And then put the clamp on. I had replaced the spring band clamp with a worm drive type clamp because I could then use a socket or wrench to tighten the clamp. I was working by myself and I could not get the end of the rubber hose to slide over the metal tube. Then I realized that even if I could it would be a pain to tighten the clamp from under the car. Then I looked at the situation from the top of the engine. I could see the metal tube, rubber hose, and clamp. And reach them with my hand and wrench. I rotated the clamp so that it faced up instead of down, so that I could tighten the clamp from the top of the engine. The first picture is the subject clamp facing down. It now faces up. Did a 130 mile drive and there were no leaks, so I put the wooden floor and carpet back in. The last picture shows 4 cracks in the bottom of the tank. My leak was minor compared to other leaky tanks I have seen. when I did mine I pulled that hose through the firewall into the trunk. There I was able to push the spring clamp bands downwards so that I could open it up from underneath with a pair of needlenose vicegrips. I don't know how many times I had to go from the top of the car to underneath to get that thing loose. BTW, when the light flashes, I checked and the coolant level wasn't lower than the MIN mark that much. But then I had to add about 2-3 quarts of water to the tank. Next day, the coolant level is back down to where it was the day before. I don't know if I should keep pouring it in. The funny thing is now my oil level went up one bar over the top(used to be mid level) and it's way over the max level with the dipstick. I don't know if the coolant is somehow found its way to mixing with oil....If that's the case, does anyone know what could have caused this and an estimate of how much this is gonna cost at the dealership? You should remove the bottom carpet from the trunk, then remove the wooden floor under it. This takes only a few minutes. My carpet was not wet but I had a leak. I had coolant on the ground only because one of the rubber plugs in the trunk had become unseated, otherwise the coolant would have stayed in the trunk. My dealer was charging 5 1/2 hours to replace a tank. I think they now charge 4 hours. $145 per hour. Sorry for the delay in responding. I was was looking for the quote I received. I think I tossed it out. I forget exactly what they wanted to charge for the tank replacement. I think the parts were in the $300 range and the labor around $500. But really, I'm guessing. The total quote was for the tank replacement and front pads and rotors. The total was either $1500 or $1700. I realize this discussion is an old one but my 99 with 62k miles needed a new expansion tank. Thanks to the messages on this board, I was pretty well prepared to tackle the job and save some $. The pictures and messages were a big help. The job took me about 4 hrs to complete and I used car ramps to elevate the rear end. It made it easy to do an oil change in the process. The expansion tank, new 01 cap and a gallon of Porsche antifreeze cost me about $228.00 from Sunset. I couldn't believe the price difference for parts between the local Porsche dealer and Sunset. The earlier postings describe the proper steps. It's definitely easier doing the job from under the car - using ramps if you have them. A good pair of notched pliers will take the pressure fitting off the hoses quickly. 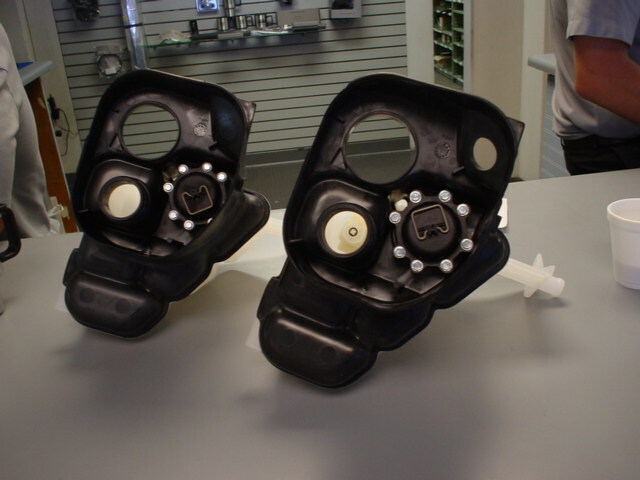 It is necessary to remove the bottom bracing and covers to have a good look. 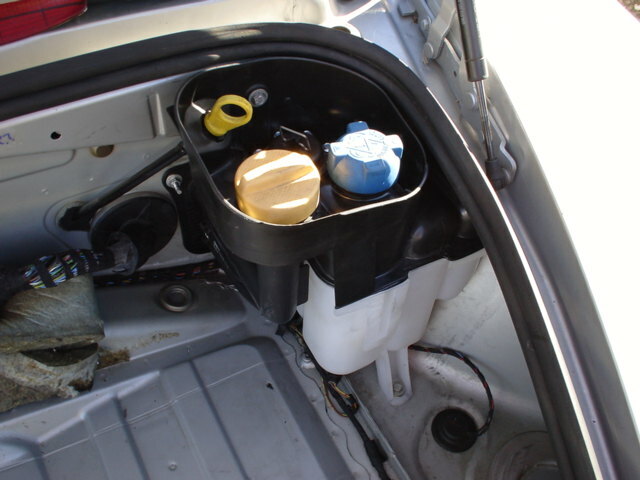 Another tip is to drain the coolant only enough to empty the expansion tank ~3/4 - 1 Gallon should do it. Save some money on the antifreeze. My replacement tank didn't have the hole drilled out for the oil dip stick. Not a big deal to drill the opening but be aware it might happen. I believe my replacement tank was a .10 - not sure if that means version 10. Crazy.... should have been a part recall or field modification from Porsche due to the poor quality of this tank. Good luck and thanks again for all the info guys. The 986 replacement tank is a 987 tank. The dip stick hole has a plastic plug, just like a 987, which as you found out needs to be removed for use in a 986. I found this out last year when I was geting ready to put in my 986 ebay tank. I took the ebay tank to the parts guy and asked him to show me the latest "tank." What he showed me was a tank with no hole for the dip stick. Then we checked PET and found out you use the 987 style tank. Then I talked to one of the mechanics. He had put in the 987 tank in a 986 and then realized it did not have the hole, but was able to remove the plastic plug. You can see the 987 tank on the left, and my 986 tank on the right with the hole. I am in the process of replacing the tank, have the replacement, trunk taken apart, definite tank crack leak. 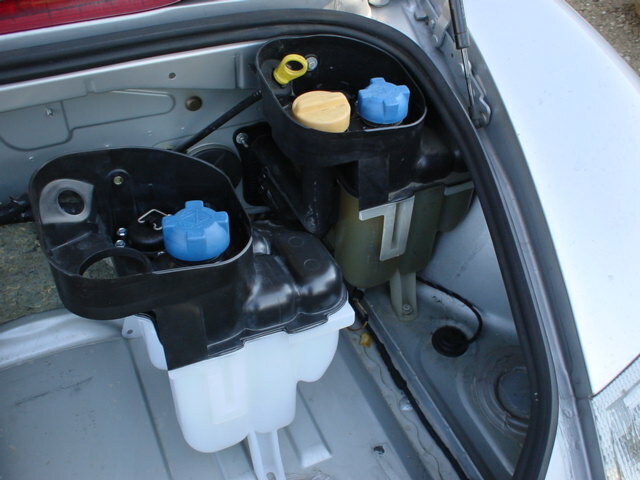 I don't understand whether I need to drain some coolant tank other than the one in the trunk tank, or not. it's removed, and fill it back up once installed. Any clarification appreciated, I will be trying replacement working from the top, without going at it from under the car, as I don't have a jack.